NGA Recent Acquisitions 1974, no. 56. Visions of Antiquity: Neoclassical Figure Drawings, Los Angeles County Museum of Art; Philadelphia Museum of Art; The Minneapolis Institute of Arts, 1993-1994, no. 45. Goncourt, Edmond de, and Jules de Goncourt. French XVIII century painters. Translated by Robin Ironside. Ithaca, 1981: 327. Martine, Charles and Léon Marotte. 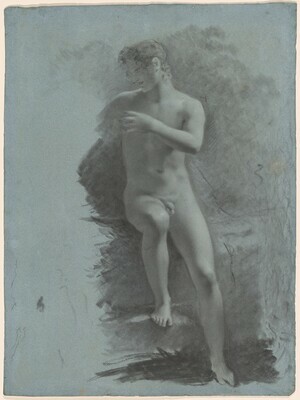 Pierre-Paul Prud'hon: Soixante-douze reproductions...accompagnées d'une vie du peintre.... Vol. 3 of Dessins des maîtres français. Paris, 1923: no. 61. Guiffrey, Jean. L'Oeuvre de P.-P. Prud'hon. Paris, 1924: no. 171. Slayman, James Hugus. "The Drawings of Pierre-Paul Prud'hon: A Critical Study." Ph.D. dissertation, University of Wisconsin, Madison, 1970: pl. 56. Walker, John. National Gallery of Art, Washington. Rev. ed. New York, 1984: 678, no. 1089, color repro. Ingamells, John. The Wallace Collection, Catalogue of Pictures, III, French before 1815. London, 1989: 324-325, under P347. Elderfield, John. The Language of The Body: Drawings by Pierre-Paul Prud'hon. New York, 1996. Laveissière, Sylvain. Pierre-Paul Prud'hon. Exh. cat. Metropolitan Museum of Art, New York, and Réunion des Musées Nationaux, Paris, 1998, 246, under no. 177. Guffey, Elizabeth E. Drawing an Elusive Line, The Art of Pierre-Paul Prud'hon. Newark, Delaware, and London, 2001, 116, fig. 76.